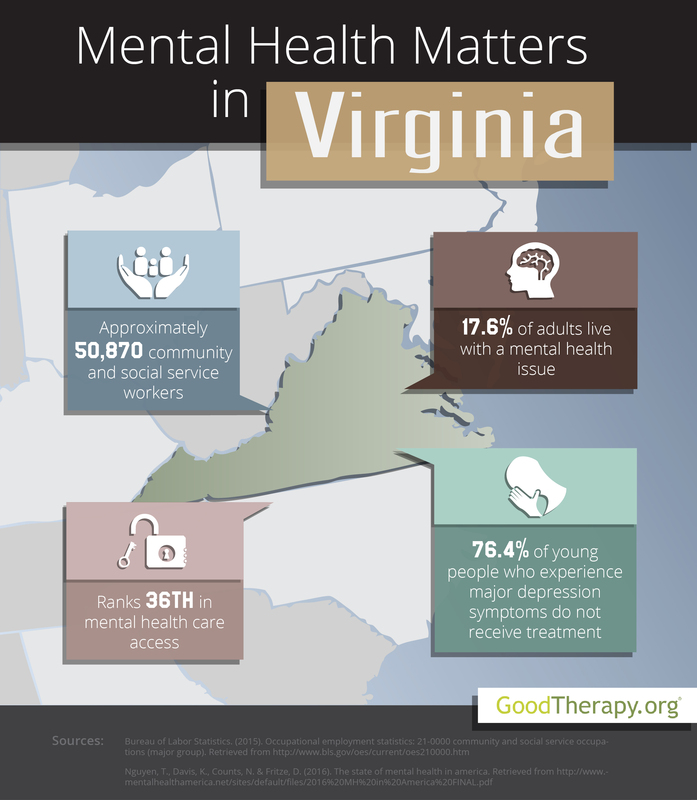 Find a therapist in Virginia with GoodTherapy.org. Nearly 8.4 million people were living in Virginia in 2015. Approximately 50.8% of the population is female. The ethnic and racial makeup of the state population consisted primarily of 70.2% residents who were white, 19.7% black residents, 6.5% Asian residents, and 0.5% American Indian and Alaskan Native residents. Young people under 18 years make up 22.3% of the population, while elderly people 65 years or older make up 14.2%. Vermont is home to 718,034 veterans. Employment data shows 50,870 residents worked in community and social service occupations in 2015, earning an average salary of $47,660 for workers in this field. In 2016, Mental Health America (MHA) conducted a survey to gauge and compare the mental health conditions and rate of access to treatment in all 50 states and the District of Columbia. At the conclusion of this survey, the state of Virginia was given an overall mental health rank of 42nd, placing in the bottom 10 of all states. Analysts from Mental Health America and some therapists in Virginia are of the opinion that this low ranking for overall mental health is influenced by low rates of high school graduation for students with disabilities in the state. Virginia also placed 17th in adult ranking, 46th in youth ranking, 29th in prevalence of mental and behavioral health issues, and 36th in access to professional mental health care. At 17.6%, Virginia has the ninth-lowest percentage of adults with mental health issues in America. This high ranking is influenced by low rates of homelessness, poverty, violent crime, and child maltreatment in the state. However, MHA research also shows young people in Virginia have a higher prevalence of mental health issues than adolescents in many other states. The 2016 MHA survey suggests depression among the younger population is a pressing concern for local mental health providers. Virginia was ranked 45th for young people with episodes of major depression in the past year, and 46th for young people with severe symptoms of major depression. It may be difficult for individuals to find a therapist in Virginia, as the ratio of residents to mental health providers currently stands at 724:1. As a result, the state is ranked 42nd for adults with mental health concerns who report unmet need, 40th for young people with severe depression symptoms who received consistent treatment, and 49th for young people with major depression who did not receive any depression treatment at all.